With an extensive coastline bordered by the Baltic Sea and with forest covering almost half of the country, Estonia has a wealth of natural food sources. With Russia a physical neighbour, and for a large part of its existence, an imperial ruler, the Russian influences on Estonian food is firmly entrenched. An Estonian’s love of the humble potato knows no bounds. Whilst fish and seafood was the mainstay of those who lived on or near the sea, the heavier meat proteins were common elsewhere. Today, this still rings true. 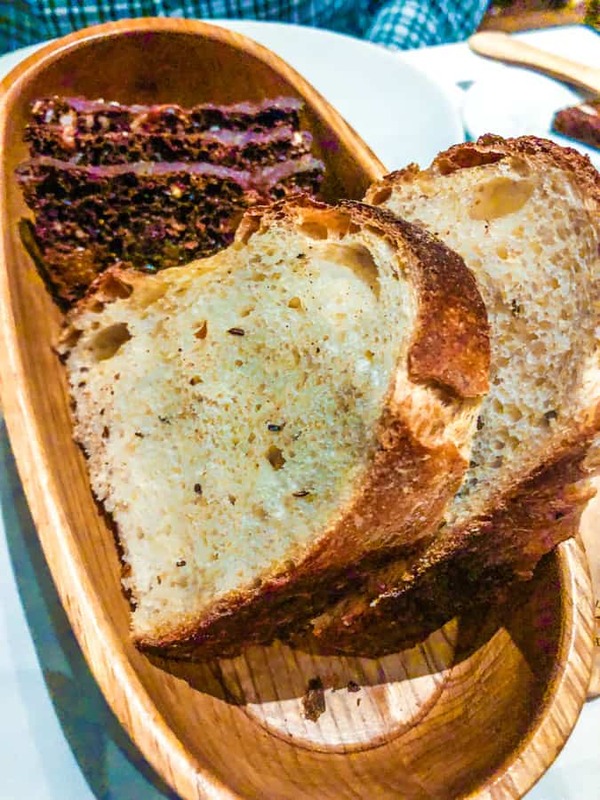 Their national bread a dark rye, with a strong malty yet sweet flavour, is perhaps one of the most delicious staples. On the foundations of a strong, yet simple food history, young chefs are now creating a new kind of cuisine in Estonia. With their access to the sea and forest and some incredible creativity, Estonia is rising to the challenge and establishing the country up as one of the leaders in modern food. Chefs travel to, and work in, some of the best restaurants in Scandinavia, learning and honing their craft, to bring back home. Before arriving in Tallinn, we did a little research on their cuisine and the types of food we could expect to get here. Not surprisingly, the well-known restaurants and tourist sites dominate the searches and advocating the need to visit a medieval restaurant. 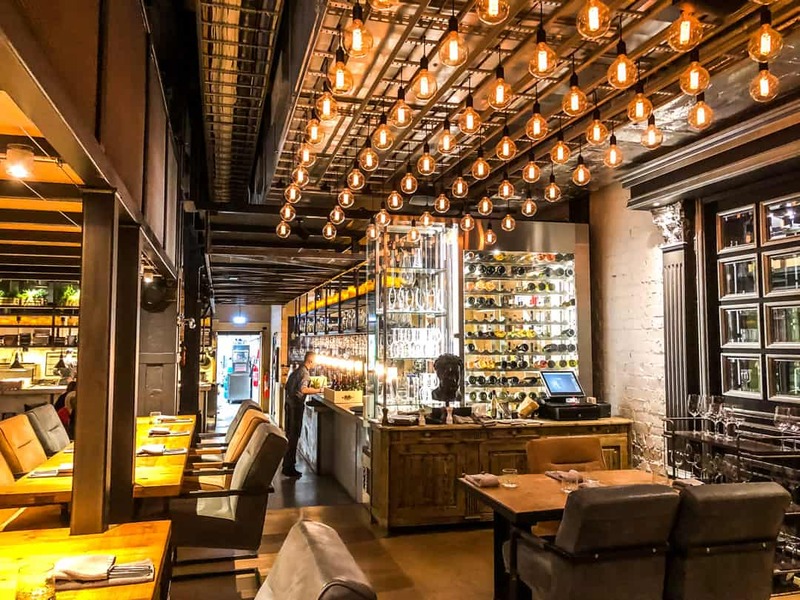 As I’ve mentioned in my previous article on things to do in Tallinn, these restaurants have gained notoriety for their themed atmosphere, mirroring the days of yesteryear in this beautiful city. They serve food that was traditional to this era, served by waitstaff in similarly aged attire. Like any restaurant dedicated entirely to tourists, the food itself will be less exciting and more predictable, and often, won’t set any records in exceptional taste. We wanted to avoid this experience, wanting more from our food adventures in Tallinn than something everyone feels they must do. This isn’t hard in Tallinn, where some very good restaurants are creating a lively and burgeoning dining scene. The best part is, for now at least, the food doesn’t come with an expensive price tag. Kaks Kokka, meaning two chefs, is located in the Rotermann Quarter, just outside the walls of the Old Town. In an area that is on the rise, hip bars and restaurants are shaping the area. Inside, the modern and minimalistic decor helps to create the story on the plate. The heavy steel beams overhead hark back to this building’s former industrial days. This is softened by slate tile walls and a warming fire nearby. The walls are adorned with wooden replicas of deer heads. Service is swift and friendly, with the waitress deftly tending to our questions about some of the more unknown items on the menu. Another delight in Estonia is that they provide you with their beautiful rye bread as part of their service. You don’t find it in the starters list, where you are forced to pay a premium for it. Nor is it extorted from you under the guise of a service charge. Estonians are proud of their heritage when it comes to bread and they believe it should just be part of every meal. We mull over the lightly salted elk meat with smoked egg yolk but in the end decide on some fried prawns. Combined with smoked avocado cream, saffron crisp and bean sprouts, it gets Stirling’s voice of approval. As good as I’m sure the chickpea curry is, I didn’t feel the need to to take a j0urney to India tonight. With the walls of the Old Town glowing under the light rain falling outside our window, I wanted to taste the flavours of Estonia. The marbled steamed buns with teriyaki pork belly, kimchi and tarragon mayonnaise also showed the reach of these young chefs but weren’t enough to sway me either. There’s a heavy theme of smoking throughout the entire menu. Smoking is a tradition in Estonia, where many months of the year are spent indoors to escape the bitter winter. Smoked foods become a mainstay of their food during this time. I finally decide on a piece of roasted Atlantic cod, so fresh that I could feel the tackiness of the flesh against my teeth as I tucked in. The potatoes come in a potato-salad style, the creaminess offset by the pickled fennel. Stirling also found it hard to let the locally farmed quail go from the starters list, so decided to have this for his main. Accompanied by a yoghurt Caesar sauce with parsley oil, crispy kale, carrots and puffed quinoa, the quail was cooked perfectly. As much as the desserts were calling out to us, probably mostly due to their seriously low price, I felt I couldn’t do it. I sense disappointment on Stirling’s face that he wouldn’t get to try the white chocolate cheesecake with strawberry jam and cherry gel. For mine, I was seriously eyeing off the juniper crème brûlée, gin and tonic gel and drunk berries. Our waitress tried desperately to convince us to reconsider. Perhaps I’ll come back to try them was my final offering. There was a definite feeling of regret as I walked the short distance back to our apartment, all under the watchful eye of those old walls! Kaks Kokka does a tasting menu of five courses for €45 per person. Expect to add €35 for matching wines. This represents incredible value and provided you are happy with their selection, it’s the most economical way to eat here. Of course, you can forego the matching wines and have your own favourite tipple or two. The starters, which are generously portioned, range from €9-12, or two can share a plate of mixed snacks for €20. The mains are €12-22, with the majority sitting in the €15-17 range. For our food, two mains and a starter (and the bread), the cost was €33. With a beer and two glasses of wine, total cost was €66. In most cases, the food was only marginally more than the alcohol, showing where the taxes and margin is applied. Where is Kaks Kokka located? Kaks Kokka is located across from the Old Town and the Kanuti Garden at Mere puiestee 63. The entrance is not off this main road, but around the back via the courtyard. It’s also a good idea to book, especially in summer. Above the vibrant and noisy atmosphere of the Beer House, Restaurant Rae Meierei is the place to be in the streets of the Old Town. On a decidedly horrible evening, weather-wise, we caught an Uber here, thinking we’d be one of only a few. It was a significant lesson in the life of an Estonian. As an Australian not really used to an ongoing regime of poor weather, I would stay inside if it was raining, never mind sleeting or snowing. Here, however, staying indoors during such weather would mean they would become a form of prisoner in their own home. Besides, whilst this might look like bad weather to us didn’t even rate a mention for them. The restaurant was jumping when we arrived, and we were pleased we made a booking. Bookings would be absolutely essential in peak tourist times in Tallinn. The first thing we noticed as we were taken to our table, with a view of their on-site cheese-making factory, were the goats. That’s right, the goats. Two goats dressed in denim no less were being led around the restaurant, stopping by for a pat for anyone that was keen. If the truth is known, they were more interested in the food their owner had. Rae Meierei is a large restaurant seating 250 people. In the main dining area, large groups are out celebrating and smaller tables are dotted in around them. Nearby, a smaller area allows for diners to have a more peaceful meal. Rae Meierei is also a cheese factory, making burrata, stracciatella, mozzarella, ricotta and halloumi from local farm milk. As cheese lovers, we can’t go past the opportunity to try some of their own so kick off our meal with 100g of their finest halloumi. Based in a charcoal oven, it’s as delicious as we expected it to be. As our cheese arrives, so too does an old-style paper bag full of freshly baked bread. The menu is extensive, with strong connections to their cheese, as you might expect. I could actually eat something from every part of their menu that contains cheese. Quickly, I look past the fromage influence and find something else I love. Duck. The smoked duck fillet on applewood chips served with honeyed pear and cherry sauce is a wow dish! I’ve eaten a lot of duck, in all forms, but this smoked duck was the best I have ever eaten. It’s really created a fascination with smoked duck, and I know this will be a dish we will recreate when we are back home. It’s got Stirling, who is also a huge lover of duck, wondering if his deer stroganoff was the right decision. When it arrives, the steam wafts off the top of his dish, large pieces of Saaremaa deer blended perfectly with wild mushrooms and a potato puree. It’s a hard dish to photograph and having a huge piece of parsley looking like it is growing from within doesn’t help but it tastes fabulous. We washed all of this down with a Dunkles Extra, a Munich style lager brewed downstairs in the Beer House and a glass of Belleruch Cotes du Rhone, a blend of Grenache and Syrah. With the drinks and food, the total was €57. Where is Rae Meierei located? Rae Meierei is right in the heart of the Old Town at Dunkri 5. It’s upstairs from the Beer House and access is via an internal staircase inside. It’s stiff competition, but Ribe was my favourite. Fantastic service, a wonderful atmosphere inside and excellent food. Ribe also gets my vote for the best “black” bread in town, with the introduction of nuts and fruit into their house blend. Operating since 2007, it’s won a swag of important culinary awards. Its reputation is strong, so once again, bookings are absolutely necessary. Operating over two levels, Ribe’s kitchen delivers fresh, innovative food, ensuring it keeps its position as one of the best restaurants in Tallinn. The theatre begins with the arrival of a beetroot macaron with chicken liver pate as an amuse bouche. The fish is truly fantastic in the Scandinavian regions and we found this to be especially true also in Estonia. At Ribe, we both settled on the lõhe, a salmon. It came perfectly cooked, with a light yet delicious sauce, pickled fennel and small pieces of romesco, the scariest looking vegetable I’ve eaten in a while. With my regret from Kaks Kokka still hanging firmly over my head, there was going to be dessert tonight. 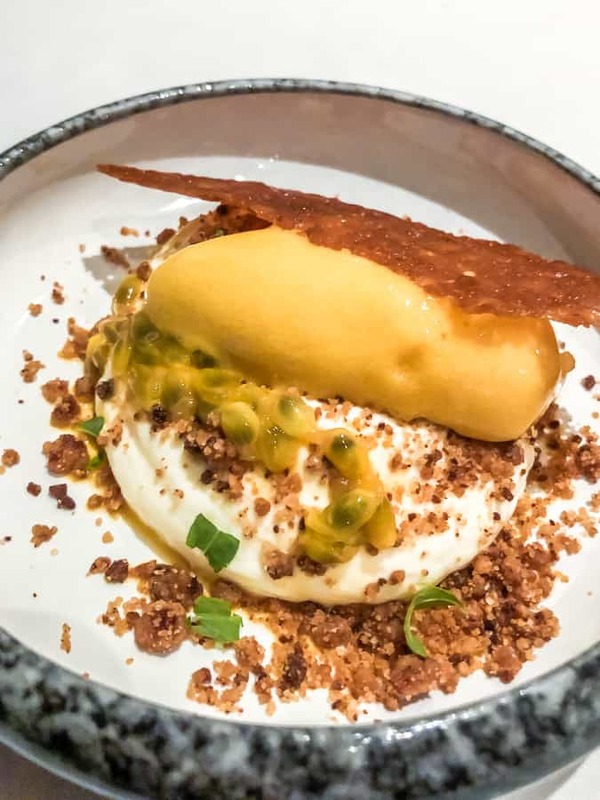 A white chocolate cheesecake with citrus sorbet and plenty of crunchy bits and chocolate cream with bark sealed the deal. I still can’t believe desserts like these are only €6 each. For two main meals, two desserts, a glass of wine and a beer, we paid €57. Ribe is located on one of the main roads in the cobbled town, inside the wall, at Vene 7. Ribe caters for vegetarians and also has a degustation menu. The a la carte menu is totally seasonal so will constantly change. Looking for something a little more casual? Check out the Beer House, under Rae Meierei in the Old Town. 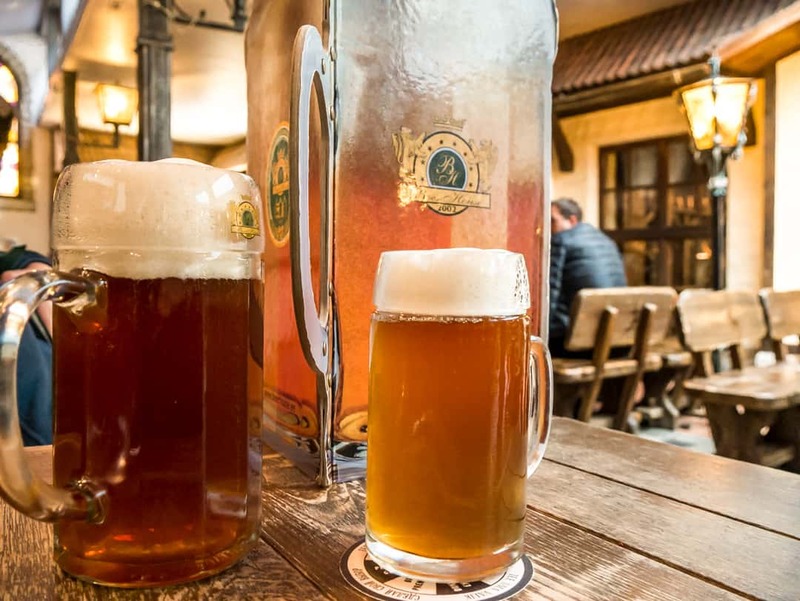 A large, Austrian-styled beer house that brews seven of its own beers and serves big, hearty Bavarian meals. We arrived at a quiet time, but the evidence of a stage and dancefloor indicated that this place goes off! Given our experience with the size of these meals, we make a wise decision and share a pork knuckle and sauerkraut served with a tasty mustard sauce. The brews on tap here are unpasteurised and unfiltered, meaning less carbonation to fill you up. The food here is very reasonably priced. The “plate-for-two” pork knuckle was €20. We paid €18 for a stein and a half-stein of beer. Where is the Beer House located? The Beer House is located at Dunkri 5, near the old well. In amongst all of the tourist restaurants, complete with touts and photos of their food on the menus, sits Wana Wiipuri. Just off one of Tallinn’s busiest thoroughfares, take a few steps down off the main road and into the cosy interior of Wana Wiipuri. When we arrive, the restaurant is full of Estonian people, surely a good sign. It’s a little late in the day when we are here so our hunger takes over, making our menu choices a rushed affair. The wild boar, braised in dark beer with rosemary potatoes jumps off the page immediately. Wild boar is not something we see a lot but when we do, we grab it with both hands. The duck with raspberry sauce, green beans and potato sounds tasty enough also. Once again, the food is very well priced with most of the main meals under €20. I expect that the prices here are still a little elevated given its proximity to the tourist trail. Where is Wana Wiipuri located? Wana Wiipuri is located at Pikk 33, Tallinn Old Town. Estonia is a small country in Northern Europe that packs a punch. From beautiful forests, the coastline of the Baltic Sea, a border with Russia and one of the most beautiful medieval cities in Europe, it's a place that must be visited. Tallinn, the capital of Estonia and one of the most beautiful cities in Europe. With parts of its medieval city walls still intact, it's a must visit on any northern European itinerary. On the western coast of Estonia, a small 12th century town still draws in the summer crowds. Known for the medicinal properties of the sea mud, Haapsalu has been attracting royalty and celebrities for centuries. Today, it's a beautiful spot to visit as a day trip from Tallinn.